5 Star hotels in Koh Samui constitute a veritable smorgasbord of accommodation options that will thrill and delight the discerning traveler with a taste for the exquisite. When it is time to kick back and indulge in pampering service on an exotic island, nothing beats the charms of Samui's luxury beachfront villas. Set amid pristine tropical nature, visitors to this renowned destination can look forward to an oasis of natural beauty with white sandy beaches, waterfalls, swaying coconut trees and crystal clear water. That said, planning your vacation will be exciting, but the sheer variety of resorts ranging from exquisite suites with your own pool to spa retreats, boutique accommodation and even hotels for adults only could leave you stumped trying to find the right hotel for you. Add to that an endless number of locations from laid-back to energy charged and choosing really becomes challenging. 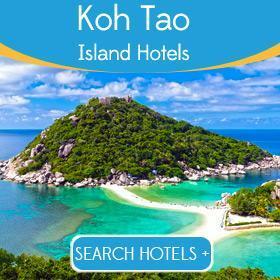 We would like to be of assistance with this and together with our list of the best luxury resorts we include a map of Koh Samui and offer information about the best beaches to stay to cast light on this challenge. Moreover, because we not only offer a 5 star accommodation booking service, but also helpful advice, we invite you to contact us, we will be happy to be of assistance. Enjoy the best of both worlds at this romantic hideaway where you can book villa accommodation with your own pool. 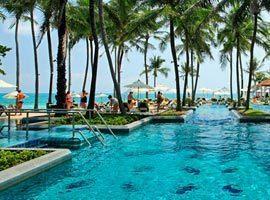 Its seaside setting is in a quiet part of Chaweng, but it offers easy access to entertainment. With villas cascading down a palm tree dotted hillside and onto a private beach between Chaweng and Lamai you will enjoy luxurious comfort and captivating views from your private pool deck. 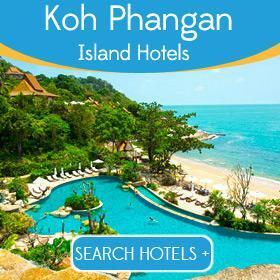 The ideal beachfront resort for families and couples nestling in a quiet corner of Chaweng, yet near entertainment. Offers a seaside pool, swim-up bar, kids club, private pool suites and sea view rooms. Hansar is a romantic boutique hotel with all ocean facing rooms located on spectacular Bophut Beach, walking distance from the charms of the quaint Fisherman's Village's shops and restaurants. 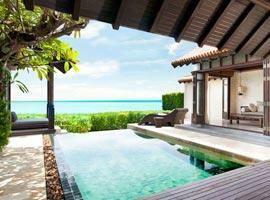 Oceanfront private pool villas in Lamai expertly blending the exquisite indoors with the tropical outdoors. 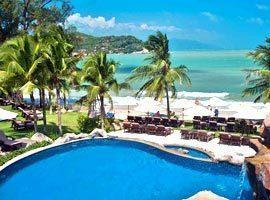 Has an infinity edge pool, delectable spa, fitness centre an romantic dinners on a floating pier. Located right on the beach in Chaweng it features a Thai design amid exotic gardens. 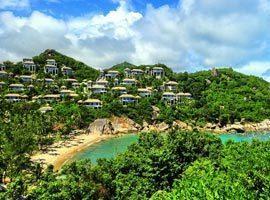 Some key features include a beachfront restaurant and bar, a heavenly pool and renowned spa treatments. 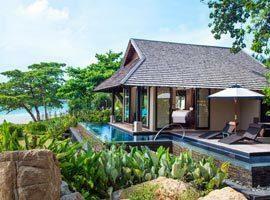 From romantic villas for couples to 2 bedroom suites for families, each with its own pool to guarantee private indulgence in spectacular Choeng Mon, less than 10 minutes from buzzing Chaweng. 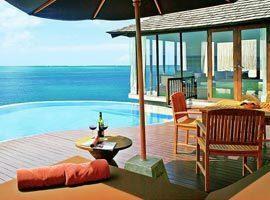 Silavadee offers the ideal luxury accommodation for a romantic holiday. It charms with an exclusive ribbon of sand aptly called Secret Beach and villas feature their own infinity edge pools with ocean views. 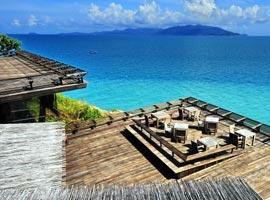 Wrapped in tropical vegetation on sloping hill Six Senses offers ocean views interrupted only by distant islands. 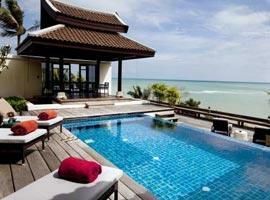 Most villas come with their own pool, glass walls and all offer a high degree of privacy. 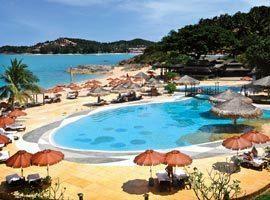 Besides impeccable guest reviews Tongsai Bay features private beach with a seaside pool in an oasis-like setting. Located in Choengmon you will be wrapped in tranquility 10 minutes from Chaweng. 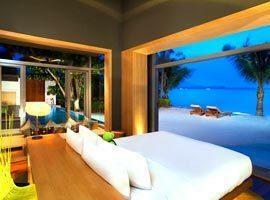 This enchanting beachfront hotel is located in Chaweng Noi, the quiet southern end of this otherwise buzzing location. 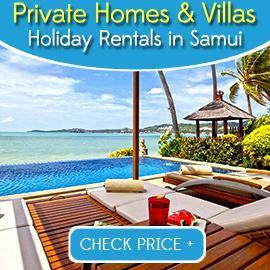 Of its key features is the privacy it offers in villas offering facilities to spoil you rotten. 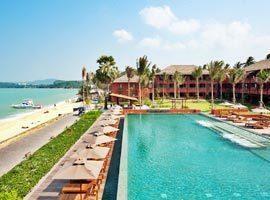 W Retreat is chic, trendy and stylish and located in Maenam, the most pristine area on the northern tip of the island. It features its own exclusive ribbon of sand and offers a high degree of privacy.